Leah Hogsten | The Salt Lake Tribune Salt Lake County District Attorney Sim Gill talks with supporters at the Utah Democratic election night headquarters at the Radisson Hotel Salt Lake City, Tuesday, Nov. 6, 2018. 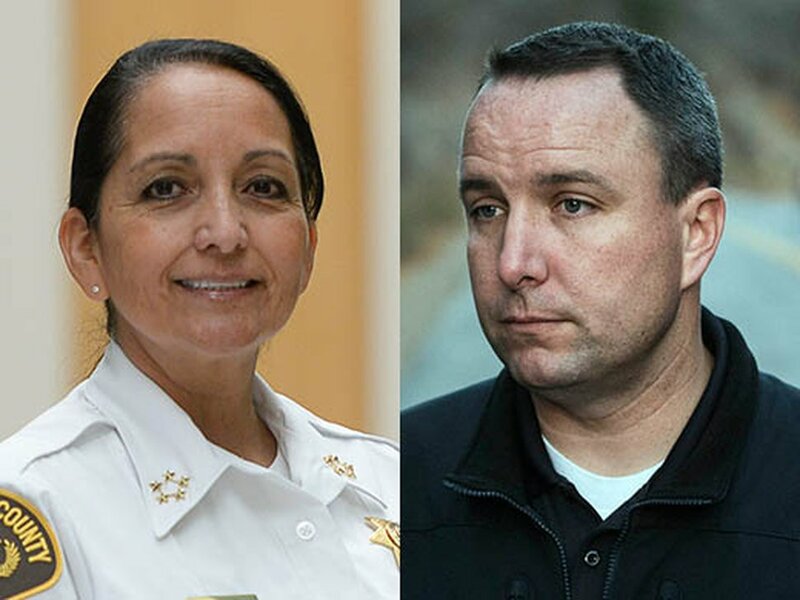 The two top law enforcement officers in Salt Lake County, both Democrats, will keep their jobs, according to unofficial election returns late Tuesday, while Republicans will retain control of the County Council. Two-term District Attorney Sim Gill held a 14 percentage-point advantage over Republican Nathan Evershed, while Sheriff Rosie Rivera packed a heftier 20-point edge over her GOP rival, Justin Hoyal. Gill positioned himself as a candidate with a proven track record of fiscal and social responsibility and with the broader focus and vision needed to address future criminal justice challenges. Evershed, who had touted his experience as a career prosecutor and aimed to paint his boss as an ineffective leader who puts politics above justice, conceded late Tuesday night. Gill said his campaign “has always been about public service” and said he saw the results as a validation of a “lot of hard work” over the past few years. The 5-4 GOP edge on the County Council seems safe. Republican incumbent Steve DeBry had a sizable 28-point lead, while Aimee Winder Newton carried a less-comfortable 8-point advantage. Democratic incumbents Jim Bradley and Ann Granato were cruising to victory, according to returns late Tuesday, while fellow Democratic Councilman Arlyn Bradshaw ran unopposed. Rivera, who became Utah’s first-ever female sheriff when she was appointed last August, lauded her challenger. Hoyal did not respond immediately to a request for comment. Rivera has focused on improving services for homeless residents, reducing recidivism among people who are convicted of crimes and keeping low-level offenders out of jail. Hoyal, a 21-year veteran of the Unified Police Department, has argued the department needs new leadership to face the future. The two agreed on most issues, like what needs to be done to address the ongoing jail bed crisis, which will likely be one of the biggest challenges facing the sheriff. 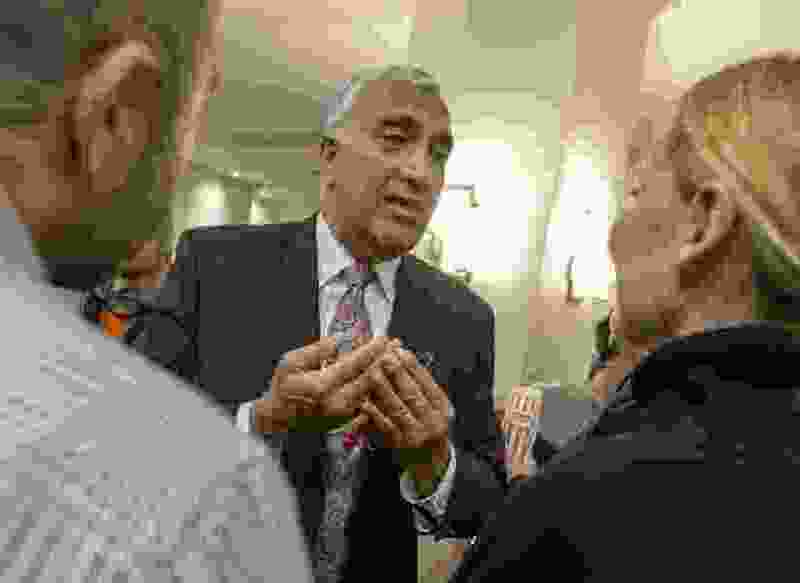 But they disagreed about where the blame rested for cities that have left the UPD to start their own police departments — an exodus for which Hoyal criticized Rivera. Republican County Recorder Adam Gardiner was the only county incumbent trailing his opponent at press time. Results showed Democrat Rashelle Hobbs with a 6-point lead. Gardiner replaced acting Recorder Julie Dole, who had taken over from the late Gary Ott. 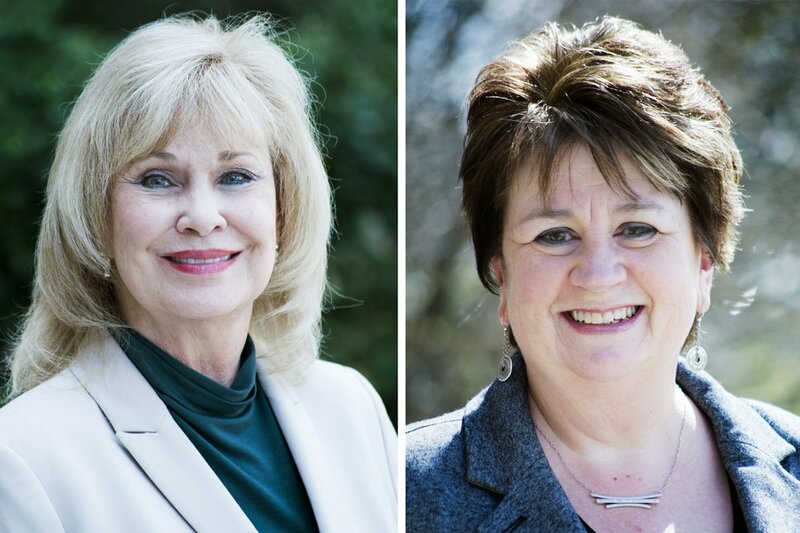 County Clerk Sherrie Swensen, a Democrat who has served in her post since 1991, coasted to yet another term, outpacing her GOP foe, Rozan Mitchell, by 34 percentage points. (Rick Egan | The Salt Lake Tribune) Sherrie Swensen (left) and Rozan Mitchell, who are running for Salt Lake County Clerk. That race turned ugly late last week when Mitchell, the Salt Lake County election director who took an extended leave of absence when she said the atmosphere in the office had become “toxic,” sued Swensen over late ballots. A judge dismissed the case Monday. Mitchell has said her deep understanding of the elections office from hands-on experience has positioned her to preserve what the county does well and target areas where it could improve. Swensen said she decided to run again to see the county through the implementation of a new voting system, as well as redistricting (where voting boundaries are redrawn after the census) in 2020. Salt Lake City leaders celebrated Tuesday night, as well, over the passage of an $87 million road bond, which had nearly 70 percent support late Tuesday night. Reporter Cara MacDonald contributed to this report.